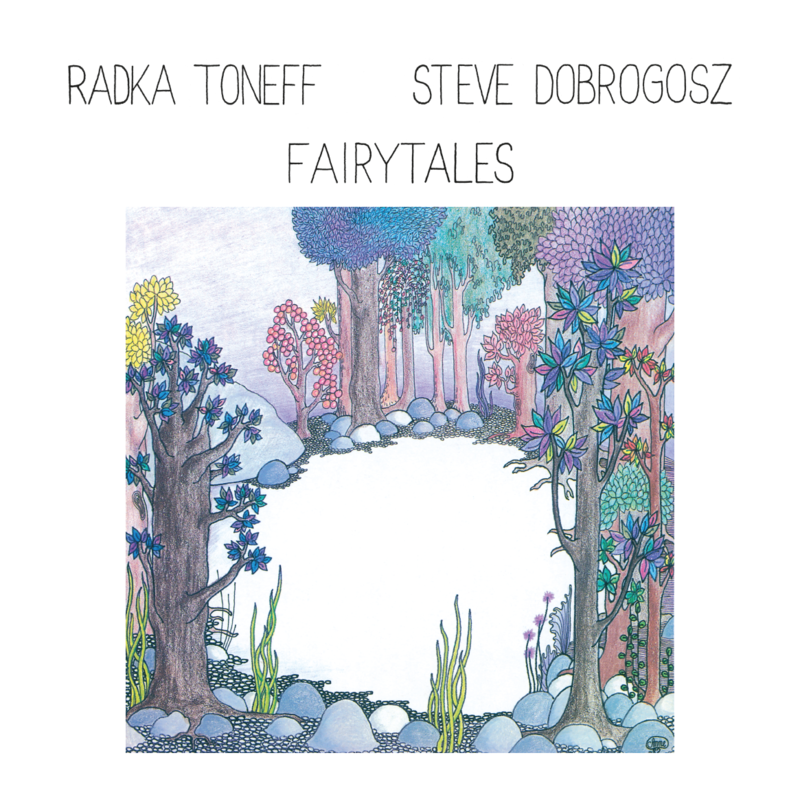 Many audiophiles and Jazz lovers will remember this seminal album by Radka Toneff and Steve Dobrogosz (recorded in just three days, 15-17 February 1982). This story gives a glimpse into some technical aspects of recovering the sound of an original performance captured at the dawn of digital. It tells a tale of obsolete and prototype equipment, of lost tapes, what to do when there is no information, a tale of detection, of building special tools, but most of all, a story of passion to bring the performance back. In early 2016 Bob Stuart was approached by the Norway National Library to see if we could help them since an earlier attempt had been incorrect. Two years later we are here; the MQA Master Edition will be available on streaming (Tidal), on MQA CD (Amazon) and on vinyl, cut from the restored masters. Later in this article, we list credits and appendices. The Telfunken MX-80 machine was one of the very first digital tape recorders; around 200 were made and sold under Mitsubishi or Telefunken brands. The Fairytales project actually used a pre-production machine in its then-imagined final form. This machine comes from the very earliest period of digital audio. The principal pathways in and out of the recorder were analogue and the built-in converters are considered primitive by today’s standard. In particular, the Analogue-to-Digital converter (ADC) is starkly different from the delta-sigma-with-digital filter architecture that has predominated recording and playback since the late 1980s. The built-in converter uses analogue anti-alias filtering and a successive-approximation converter operating at a nominal rate of 50.4 kHz with a precision of 16 bits. These ADCs were aligned in the factory and an important adjustment for each was ‘MSB level’. The Digital–Analogue converter (DAC) was more stable but still rudimentary. With the ability to spice tape and an analogue pathway, the MX-80 was thought of as a ‘superior’ analogue recorder. In some ways – particularly removing the need for a Dolby process to lower the noise-floor – this was correct. However, the early converters introduced significant digital quantisation errors; this was before dither was really understood. The digital data were stored on the tape in diagonal stripes permitting 16-bit resolution with powerful (for the day) error correction and concealment. The choice of sample rate is not entirely arbitrary. In the same era, audio recorders were developed using rotary scanning-head video platforms, for example the Sony PCM-F1 from 1977. In the PAL world, a convenient sample rate was 44.056 kHz while NTSC machines used 44.1 kHz. The Pro-Digi format used 50.4 kHz which is 8/7 44.1 kHz. The nominal sample rate for the ‘Fairytales machine’ was thought to be 50.4 kHz however, in our process we uncovered good evidence that this prototype machine had been in fact set up for 8/7*44.056 = 50.3497 kHz. Soon after 1982 this machine was modified to operate at 48 kHz by changing the reference crystal and calibrating servos. This fact has contributed to the difficulty of finding MX-80 machines that can replay the original Fairytales out-take and master tapes. The recording equipment from the Grieg Hall, had been given to Ringve Music Museum (in whose custody the original MX-80 remains). Although it was feared lost, in 2010 the original master tape was discovered in the Ringve Museum archives. The sleeve notes show peak VU levels per track. There is a test tone and subsequent analysis led us to believe that it was not exactly 1 kHz as stated on the cover, but closer to 988Hz. Note that track 5, ‘My Funny Valentine’, was in fact recorded at an NRK studio in Oslo on 27 November 1979 . This was one of the very first times the duo played together. 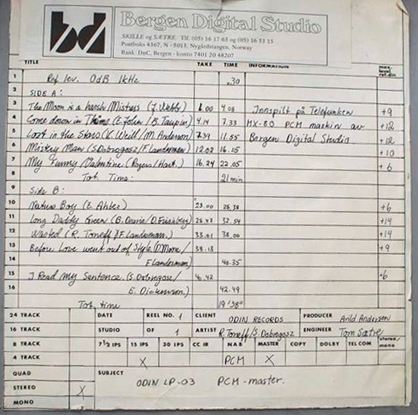 This is an analogue recording and was originally included at the end of Side A by copying the analogue tape into the MX-80 (resulting in a generation loss of sound quality.) As far as we have been able to forensically determine there was no manipulation of this track during the transfer.